One of the most anticipated features of the upcoming Xbox One is its ability to "share" digital games between consoles. Here's a look at how that works. "Everyone in your home can share digital games with each other," begins Microsoft's official explanation of the Xbox One's digital game sharing functionality. 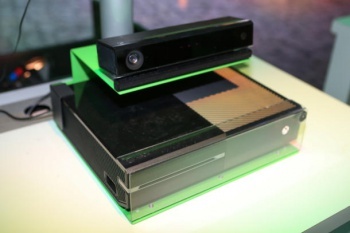 "Your Xbox One can become your virtual game library filled with digital games that different people in the home bought. Anyone can pick any digital game on your Xbox One, sign in with their own gamertag and play - even if the owner is not signed in." Neat, right? According to Microsoft, this functionality also allows players to "take their games with them." Once a title has been associated with your Xbox Live Gold account -Â and yes, you'll need a Gold subscription for almost everything mentioned here - you can visit a friend's house, fire up his or her Xbox One, and resume your game from wherever you last left it on your own console, even if your friend doesn't own the game in question. At home: You can set up your console at home so that anyone who uses that console will enjoy multiplayer gaming and access to entertainment apps - even if you are not home or logged in. On the go: You can log in at a friend's house and everyone there can enjoy multiplayer gaming and access to entertainment apps while you are logged in. Though new functionality is always welcome, it seems odd that the Gold benefit-sharing system would require the subscriber to be present wherever the features are used. Why can't we share Gold features by simply sending a message over Xbox Live? Obviously it's to prevent people from enjoying stuff they haven't paid for, but it feels like this deal could be so much more enticing if only Microsoft's prime directive wasn't "stamp out piracy at all costs." As usual, when it comes to fighting piracy, the only ones who really suffer are the legitimate users.